Utilitybilling is a cloud- based full featured, affordable, easy to use water/sewer/electricity billing software serving small cities and rural water systems since 1987. Metered, stepped & flat rate billing. Unlimited rates. Streamlined payment and meter reading entry, unlimited notes on account, customer and meter/tap. Interface modules for QuickBooks, and most AMR systems. Pros: After using for 6 years I find the product extremely easy to use. The reports are very helpful in tracking information and the Customer service is excellent. They are always there with a solution to a few problems we have. All in all an excellent product. I had never used a billing system before coming to TCRSD and John Brown and Terri Lawrence could not have been nicer and more helpful in helping learn the system. In 2007 we upgraded and Mr. Brown came to the office to Implement the new system and transfer all the information from the previous version. He also helped point out the differences in the new version and sat with me until I had it down. Cons: The only issue I have had is that the computer takes off the final penalty charge when the customer is closed out. I have had instances when the customer status is inactive and I'll go back and find a credit balance on the account of this penalty. I just have to watch for then and take off the credit balance. Overall: I would definately recommend this company and their products to any company. We have approximately 2500 customers in six different locations (companies) and we have never had any major issues with the service, software, or programming. Penalty issue has been fixed, and are no longer removed from final bills. If the penalty was on the bill at the time of the final calculation, it remains there. Couldn't ask for a better program. Comments: Can't find a Utility program, for this price, that could Possibly be any better !! As a non-profit company, we can not afford just any program. The WaterWorks program is everything I needed at a price we could afford. It is easy to use and even IF you can't find an answer to what your looking for, you can always call the 800 number. Terri and John are very friendly and knowledgeable . They have never failed to help me. A couple of times I've called and got the answering machine. They have ALWAYS called me back within the hour. There are a couple of things that I wish the program could do, but it is not anything that can't be worked around. There are several safety screens included in the program to help with making sure that payments and reading are correct. There are also, many different reports that can be printed . The bottom line for me is that the WaterWorks program does everything I need it to do and when it comes time to read meters and get ready for the new billing, this program has given me 6 extra days to get my work done. FINALLY, I can do my job without so much stress ! Cons: Have not really found any cons. If i get stuck i will call Terri, and end up saying duh. Overall: Everyone should use it. Comments: We have been using this product since the mid-1990's and have been happy with it. It was simple to set up and learn. Any time there was an issue, help was only a mere email or phone call away with an immediate response and solution. Any suggestions that were made about improving the product or adding a report were taken into consideration during the next upgrade. By the way, email notifications are always sent out if there is an upgrade. I have talked with many locations that spent thousands of dollars on expensive, fancy software packages and were not happy with the outcome. 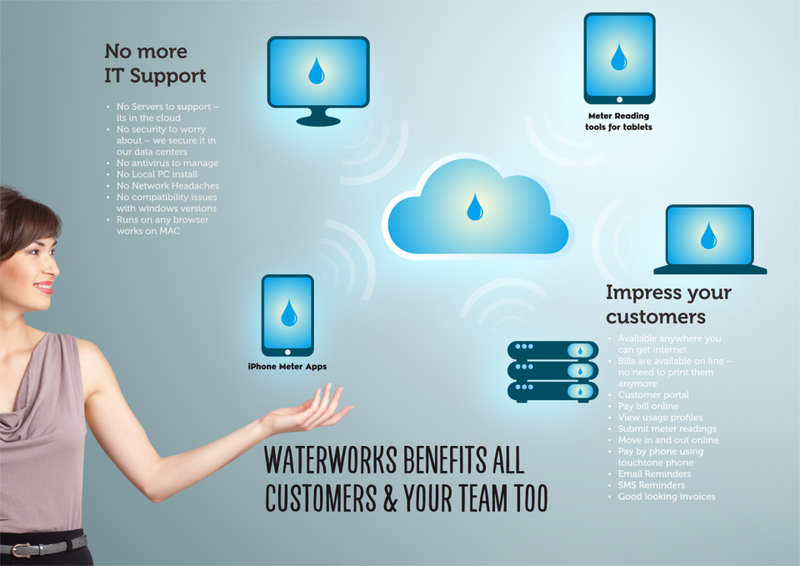 I would recommend Waterworks to anyone with a water billing system - large or small. Great Product! Even Greater Customer Service! Comments: As a small city we just could not justify the cost of high-priced municipal accounting software. We decided to adapt Quickbooks to our accounting needs, and we needed a utility billing software package that would interface with Quickbooks. Waterworks met this need and more. 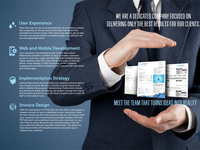 Transitioning from our previous utility billing software occurred quickly and accurately. Waterworks customer service has always been friendly, responsive, timely, and competent. Our accounting staff could not be happier, and our auditor is pleased with the software's reporting capability as well. Comments: Our water system have used this utility software for many years. We are very pleased with the ease of using this software as well as the set-up. The help Index is very useful. When I have called to get advice on how to do something or update or change something, I have always recieved friendly, extermly helpful and courteous service from both Terri and John. As the secretary I appreciate how they make things easy and when you call they treat your call and every call like it is important to them and they somehow help you solve and resolve any issue you may have. Thumbs up for them! Comments: I used the program in billing for the Village for close to seven years. The program was easy to install and enter customer information. The only problem I had was getting rid of old accounts. But, the lady I dealt with, 'Terri' was great at helping me solve my problems. John, the boss, well he was plenty patient with me and took the time to help. I dealt with Terri, mostly, and she is on the ball and patient as well. I think they could include a couple of things, but overall the program gives what is necessary for billing and records. Pros: I have used the WaterWorks program since 1993. I have always found the software to be user friendly, easy to learn, easy for me to train others to use. Their staff is always so helpful and willing to assist you that it has always made it a joy to work with them. I am very grateful that we have their software and great customer service!!! Thank you LMS!!! Comments: This software is very easy to understand, quick to learn how to use, and if you ever have any questions what so ever, no worries, they have the best Customer Service. Its not just like calling for help with a company but calling for help from a friend. When I call Terri its like getting personal help from a friend who knows everything about my company as well as me as a person. I have never or will never plan to switch to anyone else. Thank Goodness for WaterWorks!!! Comments: The product is good, but the Customer Service is AWESOME! Our Rep is Teri, and she is always very willing to help, has the right answers and follows up on all requests. We appreciate her so much! WaterWorks allows our City to seamlessly bill our patrons monthly, and typically if there is a problem with the billing it is on our side, and not based on the product. We are very satisfied, and we wish all of our software was as easy to use. I am new to billing utilities and I am so glad I chose WaterWorks. Comments: I knew nothing about billing for a rural water system and chose this software because of good reviews. I am so glad I did, this software is very user friendly even for newcomers! The customer service is excellent. I called several times after set up with questions and Terri was so patient with me and if I had to leave a message or she was helping someone else when I called, she always calls back very quickly. Comments: I started with my city a little over a year ago, the previously city clerk had been fired leaving me to start with zero training. I was able to call Terri and I did DAILY she was very friend gave me the training I needed to do my job smoothly! If it wasn't for Terri and Waterworks I would NOT have been very successful at my new job! Thank you Terri!! Pros: Love this program. I know if I can't remember or can't figure something out my trusted buddy (Terry) can. She is a phone call away & is always so nice - no matter how many times a day I may call her. Comments: WE HAVE BEEN USING WATERWORKS SOFTWARE HERE AT THE CITY OF MILLER FOR 15 YEARS OR SO. THEY UPGRADE THEIR PROGRAMS AND ARE ON LINE OR CAN BE REACHED BY PHONE WITH ANY PROBLEMS YOU MIGHT INCUR. STAFF IS FRIENDLY AND ALWAYS HELPFUL. SELDOM HAS THERE BEEN AN ISSUE THAT THEY WERE UNABLE TO HELP WITH. WOULD HIGHLY RECOMMEND THE SOFTWARE TO ANYONE. Comments: I have been an asst. City Clerk for almost 15 years and this is by far the best, easiest most cost effective software the City has ever used. Prior to finding WaterWorks we had tried 3 different software companies within the last 2 years. Can't wait to see what the future holds for the customers and WaterWorks. Pros: This system is the best I have used. It's very easy to follow and if you ever have a problem you can call and talk to someone. Easy to add people and disconnect. Overall: I highly recommend this company. They are always trying ways to improve to make it better. Pros: The City of Everton has been using WaterWorks for approximately 13 years. It is a wonderful program; very easy to use. The tech support is excellent! They are always so friendly and patient! I would recommend this program to any one. to try any other software because I think water works would be hard to beat in every area!!!! Recommendation by Terri to export infomation into speadsheet and customize saved me alot of work! Comments: So much more versatile than I imaged. Called Customer representative with some concerns. Terri explained a couple of options and helped walk me through the process of exporting information from Water Works. I then customized the report as I needed it and saved me a lot of work. 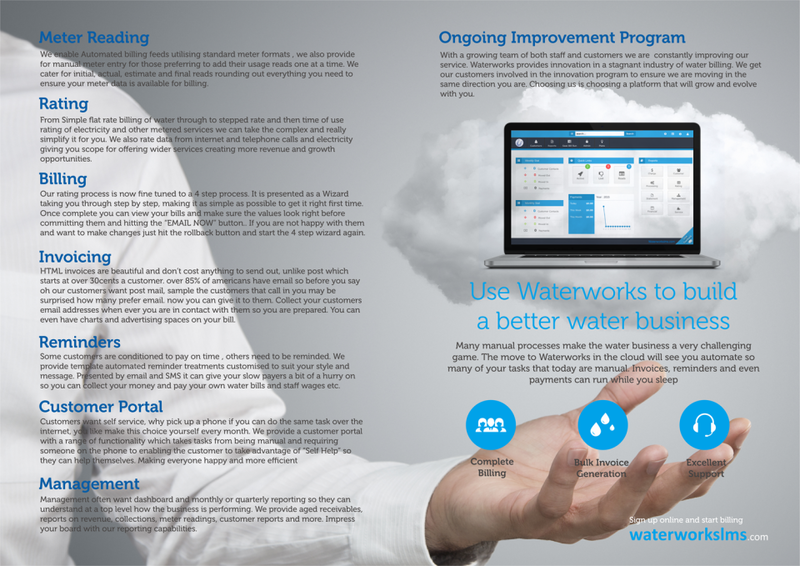 Pros: We at Compton Water have been very pleased with Water Works software. Their tec support is knowledgeable and always eager to help us with any issue. We appreciate their service and product! Overall: I highly recommend this service and product! 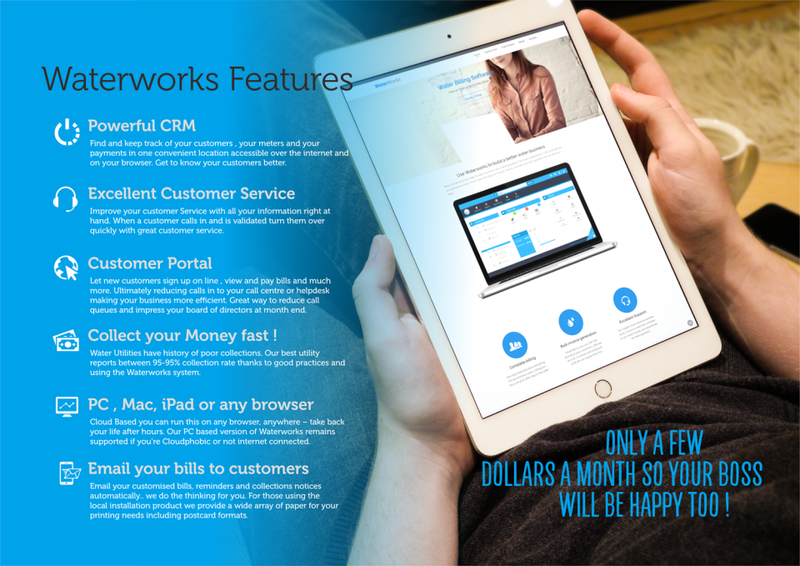 Comments: LMS Waterworks is an awesome software to use for your utility billing. The customer service is phenomenal, Terri and John are very knowledgeable they will help you in any way, taking all the time needed for YOU to understand everything and every question you have will be answered. Comments: This software is so much better than what we were using. If I have any problems with it I just call Teri and she irons the kinks out. I like that there are so many reports with this product. I use it to fill out information for the system all the time. Comments: I have used WaterWorks for over 18 years and I would not even consider changing to another program. If I need support (maybe 5 times in the 18 years) they always answer my questions or walk me through my problem. I highly recommend this program to all water utility companies. Comments: We use WaterWorks for billing our regional Public Water Authority customers. It is easy to install, easy to use, and does everything we need. Any questions that we have are quickly answered. I can recommend this software without any reservations. Pros: I am very pleased with LMS Waterworks, I myself have been using it for going on 14 years and it was installed before I became the City Clerk. Terri is amazing for help.. They Rock! Cons: I can't think of any cons. Overall: Terri and John are great. Comments: Our city has used WaterWorks since 2005. It has worked flawlessly. Their support is both knowledgeable and above all quick and always corrects the problem. They take customer feedback to heart and will go the extra mile for any customer. Well done WaterWorks! Comments: I have thoroughly enjoyed working with Terri. She is a very pleasant, knowledgable person to work with when I have issues. The software is very user friendly, and when there are needed Improvements or programming issues they are concerned and work on the. Comments: This program does exactly what we need it to do without being complicated and requiring multiple fields to be filled before you can move on to the next screen. Customer service is also great. We've never had a bad experience. Comments: WaterWorks is very user friendly once you have been introduced to the different uses of it. There are still new uses that I seem to find every once in a while, with the help of my VERY USER FRIENDLY helper (Terri). Comments: I was new to bookkeeping for a water district. WaterWorks is very user friendly. It is very easy to learn and if you do have any problems, you can just call support and they do an exceptional job with helping their customers. Comments: This software has been a life saver for both myself, and the city. Anytime i have had any issue what so ever they have talked me through it or help on line. Great product, great service, and great personnel. 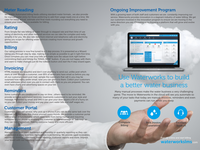 Comments: The waterworks software integrates well with the Meterphone software offered by LMS. Terri is extremely timely responding to questions and is knowledgable about their products and provides great customer support. Comments: WaterWorks is wonderful. Our computer system crashed a few years ago and with the help of WaterWorks Online Back-Up & and Terri we were back up and running quickly. I highly recommend WaterWorks!!! Comments: I have always received excellent support for this system as I was new to using this system and never have had an issue gets answers to those questions I have had learning how this program works. Comments: WaterWorks is a great program and easy to learn. If you need assistance you have immediate, helpful assistance. I do not have any other utility program to compare to so my rating is 4 stars. Comments: The WayerWorks program is very user-friendly. When I have had questions,even on the weekends, Terri has been very willing to assist me. Her customer service is outstanding. Comments: The software is easy to learn and use, and Terri has been a big help to me as well. She is wonderful! I would highly recommend this software to everyone I know that is looking!!! Comments: We have been using this software for awhile and have not had any problems. Questions are answered very quickly and understandable. Comments: Our company has used this software for many, many years. It has always performed as intended and the support is first class. We will continue to use this program as it suits our business needs. Comments: Customer service is top-notch. A drawback has been that the software was NOT compatible with MAC. I understand this is changing which is beneficial for me. Comments: I like working overall with this software it's user friendly, reports are fast and easy, and working with great friendly people to help when we need help. Comments: Very easy software to learn. When you need help Customer Service is always there to help. Will walk you through the steps you need help with. Very friendly. Oh, but we can! I'll show you where you can change that. Pros: Very good service, I love the problem it is easy to operate. If i can do this program anybody can. Overall: Overall recommendation is that you try this program. Professional and easy to learn! Comments: This is the second water utility software I have worked with and I have truly enjoyed the program and the tech support is wonderful! Overall: Since this is my first time working as city clerk, this is the only software that i am somewhat familiar with, it appears to be great. Comments: Its very easy to learn and use. The company is improving the Software at all times. The best customer service around.